The German Air Force (Luftwaffe) has been examined in a lot of works. Much less well-known are the air forces of Germany's allied countries like Hungary, Romania or Finland. But because of its lesser degree of participation the history of the Royal Bulgarian Air Force remains hardly known. Several works by Nedialkov, Neulen or Boshniakov have elightened readers with a good knowledge about the matter. 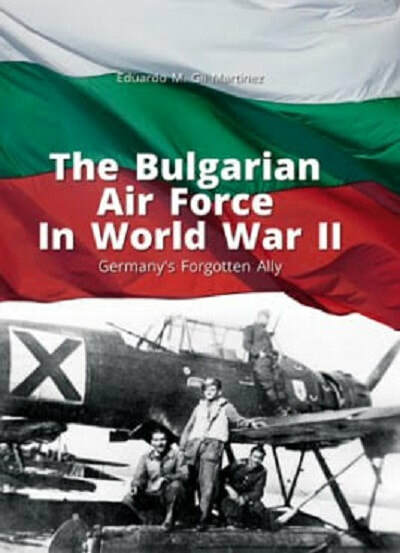 In this work the author has tried to create a text that would enable all readers to understand and learn the most important facts in the history of all branches of military aviation in Bulgaria since the 30's to the end of World War II. For this, it has been necessary to look for information in different sources, from the main ones to the lesser common ones, to try to complete the research and offer it in the most definite way, but not trying to be exhaustive, but as educational as possible. Finally, this work is used to pay tribute to all the members of the Bulgarian Air Force who fought in World War II, a war whose consequences marked the future of the next 45 years in the country's history. The author, Eduardo Manuel Gil Martinez, has been a Spanish history enthusiast for years. Specialising mainly in World War II and the Reconquista age (Middle Age in Spain). During many years he wrote several texts about World War II in Spanish and Italian magazines like "Revista Espanola de Historia Militar" (Military History Spanish Magazine), AMARTE, "Ritterkreuz" ("Iron Cross") or "The Axis Forces in World War II 1939-1945". Always trying to write about matter less known in Spain, he wrote several books and texts about about World War II and Middle Ages in Spanish and English languages. "Sevilla Reina y Mora, Historia del reino independiente Sevillano, Siglo XI" (about the powerful Islamic Kingdom of Seville during the Taifas age after the end of the Umayyad Caliphate of Cordova). "Espanoles en las SS y la Wehrmacht 1944-45. La Unidad Ezquerra en la batalla de Berlin (about the still very unknown history of the Spanish soldiers that fought besides the Germans after the return to Spain of the Blue Division and of the Blue Division. "Breslau 1945, now Wroclaw in Poland and The Spanish in the SS and Wehrmacht 1944-1945. The Ezquerra Unit in the Battle of Berlin". At the moment he is working on a text about Hungarian armoured forces during World War II in Spanish language and an article in Italian language about Spanish soldiers in the SS and in an article in English language about the Spaniards who fought in the Battle of Berlin in 1945. Kagero Publishing is based in Lublin, Poland. This book is soft bound of 168 pages in 6 3/4" x 9 1/2" page format. The cover art shows a black and white photo of a staff members of the 161st Bulgarian Air Force Squadron posed proudly with one of their Arado Ar.196-A3 float planes at the base of Chaika. This seaplane flew in all European fronts where Axis air forces fought. This photo appears again inside the book. The photo is below a color illustration of the Bulgarian flag. Dornier Do-11 - Heinkel He-51 - DAR-3A -PZL P24B (8 photos)- PZL. 43- Arado Ar.65 - MB.200 - Bf-109E (11 photos) - DeWoitine D.520 (5 photos) - Dornier Do-17K (4 photos) - Avia B-135 (4 photos) - a photo of Bulgaria's top ace Stoyan Stoyanov - Bf-109G (9 photos) - Bf-108 - Fiesler Fi-156 Storch (3 photos) - Arado Ar.196 A3 floatplane (9 photos) - Avia B-71 (2 photos) -Junkers Ju-87D-5 Stuka (2 photos) - Avia B.534 (5 photos) - Arado Ar-96 (2 photos) - a rare wartime color photo of a S-328 - Focke Wulf Fw-189A-2 (2 photos) - B-24 (2 photos) - P-51 Mustang in rare color photo - B-17 Flying Fortress - B-25 - P-47N Thunderbolt - DAR-10 - KB-11 (3 photos) - Focke Wulf Fw-58 - P-38 Lightning - 5 photos of different Bulgarian pilots. PZL. 24B (4 profiles) - Bf-108 (2 profiles) - Bf-109E-4 (2 profiles) - Bf-109G-6 (3 profiles) - Bf-109E-3a - DeWoitine D.520 (2 profiles) - Arado Ar-196A (2 profiles and a 4-view)-Junkers Ju-87D Stuka (2 profiles and Dornier Do-17M (2 profiles). B-24J "Mitchell" in the Pacific - P-51/F6 "Mustangs" in the Pacific - P-51/F6 "Mustangs" in Europe - Curtiss P-40 "Warhawk" - Grumman F6F Hellcat - B-17 Flying Fortress in Combat over Europe - P-47 Thunderbolt & B-25 Mitchell. Panzer II & Luchs - Mi-28 helicopter - British Infantry Tanks- Panzer IV vol. 1 - Ka-50 & Ka-52 helicopters - Panzer IV vol. 2 - Char Leclerc & Brummbar. This book will be of great interest to modelers and aircraft historians alike. I want to thank Casemate Publishers, the North Armerican distributor for Kagero books, who sent me this sample and the folks at Kagero.